Posteromedial lesions: often asymptomatic, with no history of trauma. Less risk of osteoarthritis. Anteriolateral lesions: usually symptomatic, associated with trauma. Lesions are located either posteromedial or anterolateral on the talus. History of ankle sprain is common. May have crepitus with ROM. Tender along tibiotalar joint line either anterolaterally or posteromedially depending on lesion location. MRI should be performed on pts suspected on having talar OCD. 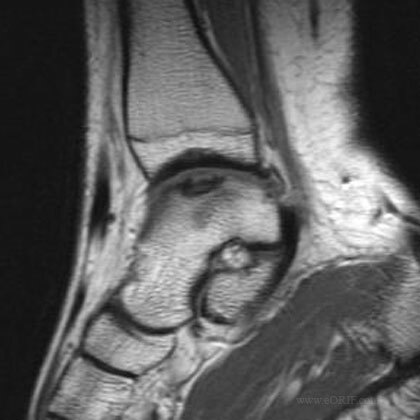 MRI allows determination of location of lesion as well as integritiy of articular cartilage. CT provides best definition of bone fragments seen on plain xray, but not as helpful at detecting suttle lesions. Bone scan can identify lesions, but is not helpful in determining integrity of articular cartilage. stress radiographs indicated if instability detected on exam. Stage I=small area of compression of subchondral bone. Treatment = an initial period of no weight bearing with cast immobilization, followed by progressive weight bearing and mobilization to full ambulation by 12 to 16 weeks. Stage II=partially detached osteochondral fragment (a flap). Treatment = an initial period of no weight bearing with cast immobilization, followed by progressive weight bearing and mobilization to full ambulation by 12 to 16 weeks. Large-Volume Cystic Talar OCD: consider fresh osteochondral allograft (Raikin SM, JBJS 2009;91:2818). Start AROM, PROM at 1wk post-op. NWB for 4-8wks or until healing evident on xray.